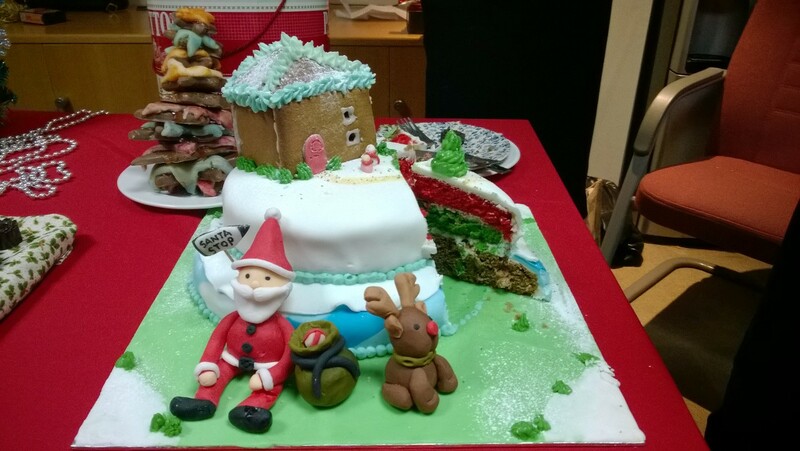 Special guest blogger, Cat Holland, explains how to make her fantastic ‘Santa’s Coming to Town’ cake. The figures need time to dry and harden and so it’s best to make these a couple of days before you make the whole cake. If you haven’t made icing figure before there are lots of YouTube clips out there so I recommend you watch a few to give you an idea of what to do and what you need. 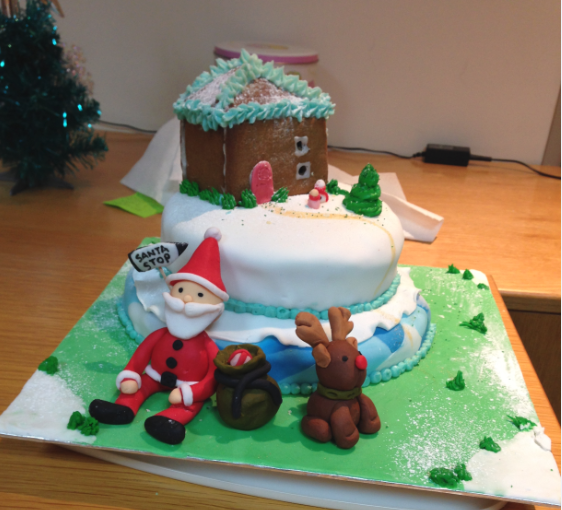 To make these figures I used white ready to roll fondant icing and coloured them using icing colour paste. I made each of the body parts and constructed the figures using cocktail sticks, water and a paint brush. You can use edible glue but the icing becomes quite tacky when it’s being handled and so water is enough to hold the icing together. 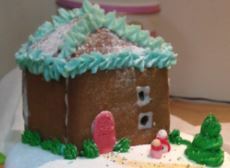 I used my favourite gingerbread biscuit recipe for my house. There are lots of recipes out there and so I suggest using one with the right balance of flavours for you. Using a ruler, pencil and baking paper I drew and cut out the shape of the house including windows. Have a think about the size and style of the house and roof you would like for your house before drawing. When your ginger bread biscuit mixture is rolled out, (to approx. 5mm thick) place the baking paper cut outs on top and cut around then shapes using a pizza slicer for ease. Make sure you leave an extra 5mm around the roof triangles to makes sure they are big enough to fit together. Lay the cut out ginger bread on to a baking tray cover with baking paper and put into the oven until they are golden brown, approx. 18 mins, depending on your recipe and the thickness of your ginger bread. When it is baked, leave it to cool. Check that the pieces will fit together and then get making the icing and butter cream. To stick my house walls together I used icing sugar and water and piped it on to the edges. After a couple of hours I used a stiff, coloured butter cream, put into a piping bag with a star nozzle to stick the roof together and on to the house. The butter cream has a pretty finish, is strong and can cover up any gaps you may have between the biscuit. Once it is dry and stable you are free to decorate the house as much as you would like. I decided to go for a simple house, but did add brown icing onto the roof to create a tilling affect. I wanted my cake to have Christmas flavours as well as a Christmas design and so I decided on the following; chocolate & cinnamon with dark chocolate chunks and a orange flavoured sponge. I then double/ triple this mixture depending on how much I need and then add the flavour I want. To make the inside look Christmassy, I used my Christmas silicon pop cake mould to bake green mini trees. I then placed these in to the cake tin with the chocolate mixture before going into the oven so that the mixture would rise and bake around the already baked Christmas trees. To make the orange flavoured sponge Christmassy I split the mixture between two smaller tins and added red bake safe colouring paste to one and green to the other. Both cakes went into the oven for approx. 20- 40 minutes. To cover the cakes before icing them with rolled fondant icing, I made a stiff butter cream flavoured with the juice of half an orange. Covering the cake with butter cream ensures that the rolled fondant icing has a smooth finish. I wanted the outside of the cake to tell a story and to use blues and whites to represent winter and snow. The bottom tear was wrapped with a blue plaited icing and covered with a flared white icing. The top tear was covered with plain white icing all over and trimmed neatly. To create the plaited blue and white icing I added icing colours to two balls of icing to create different shades and left one ball white. Using an icing smoother, I rolled the balls into long sausage shapes. These three sausage shapes were then plaited together. With a rolling pin I flattened and rolled out the plait to create a bonded patterned icing to wrap around the sides of the bottom tear. Using plain white icing, I rolled it out and then cut a circle using the tin it was baked in and placed it on top of the bottom tear, scalloping the edges to give the wavy effect. I then placed the top tear on top. With a circle nozzle I piped blue butter cream around the edges of the cake to create a clean finish. When the main cake complete you need to decide how you want your cake to look. I placed the ginger bread house on top, painted a pathway, and used green butter cream to ice on a Christmas tree, and grass. 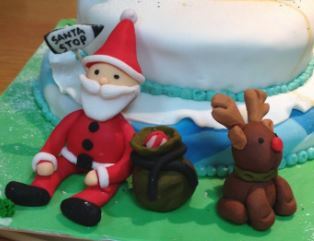 And that’s how I made my “Santa’s Coming to Town” Christmas cake.